Advanced Angler.com’s Dan O’Sullivan is at Lake Guntersville in Alabama for a media event with Toyota Trucks pro staffers Terry Scroggins, Mike Iaconelli and Gerald Swindle. The event is being held at Dream Ranch; an amazing lodge near the shores of one of the most famous bass lakes in the country. The focus of the event is to work with the pros to gather educational material that will fill the pages of Advanced Angler for months to come. After a morning delay caused by the colder temperatures and drizzling rain; we jumped in Swindle’s Tundra and followed Scroggins and Jason Sealock from Wired2Fish.com to a nearby boat launch and slid his Triton in the water. After a three minute run to the first fishing hole, Swindle idled under an overpass and set up shop on a road bad that ran parallel to the highway. We once again pulled out deep diving plugs and started making long casts across the roadbed. It didn’t take long for us to get going, I caught the first fish on my third or fourth cast with a Rapala DT14, and Swindle soon followed. After fishing for about 30 minutes, and catching several bass to four pounds, I decided to pull out my camera and record the fireworks. Swindle made cast after cast after finding the line that he needed to retrieve upon. He caught more than 30 fish by quickly retrieving the deep diving plug, and his overall limit tipped the scales at nearly 25 pounds. At 11:00, after fishing for around two hours, we set up shop in a backwater area to do our photo shoot. We finished the photo shoot and returned to the lodge for lunch and a little more work. We filmed an Under the Lid with Swindle and set up for the afternoon. We left the for another launch area in a different part of the lake and set up to fish some outside points , humps and bars. After making three quick stops, Ike decided to try a little flat point on an inside creek channel bend. He picked up a Rapala DT6 in Helsinki Shad and made a cast up near the rip rap. He immediately set the hook into a heavy fish. The fish turned out to be a solid six pounder that he landed and gave one of his trademark yells. Even though the event was a working day as opposed to a tournament, Ike is excited to catch quality fish. We ran to another spot, stopping to shoot a Lowrance video on finding and reading deep structure, and then moved on to a spot that Ike fished in his 2006 win here at Guntersville. He caught several more bass and we shot some more photos before heading back to the trailer. Once we got into the parking lot, Ike was greeted by three fans who saw his Tundra and trailer in the parking lot and waited for him to return. He stopped and took pictures with all three; he even let them hold some of the fish we caught for the pictures. Well, tomorrow is a final wrap up day, we’ll get a few straggling pieces of work done and head for the airport. 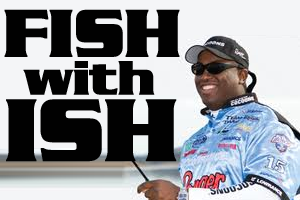 Saturday is another media event back home with Kent Brown and Ultimate Bass Radio at Lake Pardee in Northern California. There have been three smallmouth over seven pounds; two of them nine pounders in the three year history of the event. We’ll see what we find there.